Keep passwords and private files inside a secure file on your computer, protected by a master password and a military-grade encryption standard AES, and organize them. Use a built-in random password generator to generate strong secure passwords. If you are having problems remembering all your access passwords and logins, would like to protect yourself against identity theft and need a reliable software solution to store files with confidential information in one place safely and securely, you need to get SecureSafe Pro Password Manager. On the market since 2004.SecureSafe Pro Password Manager uses a military-grade encryption standard, approved and used by the US Department of Defense (namely AES, Advanced Encryption Standard with 256-bit key). Using SecureSafe Pro password manager, you do not have to remember all of your passwords and logins. They are stored in a database tree, which is very easy to search and navigate, so your passwords will be organized perfectly.When you visit a site, using a login and a password, simply click the SecureSafe Pro Password Manager icon, conveniently located in the system tray, enter your access password, and that\'s it. Never check \'Remember my login and password\' box on websites, since it is not safe and may lead to getting access to your private information by hackers, or worse yet - stealing your identity. Use SecureSafe Pro Password Manager instead.The program also includes a number of safety precautions, such as the unloading of access data if the program is left idle, and a \'tough random password generator\' feature.This program is not just another password keeper. You can store regular files inside the program. 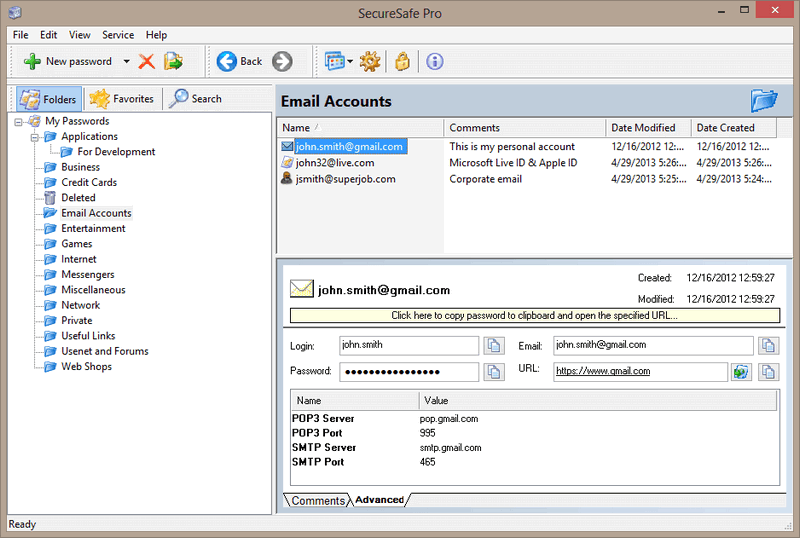 The program can store any file and all files can be launched from SecureSafe Pro Password Manager. The files stored with SecureSafe Pro Password Manager won\'t be visible and accessible to anybody but you. There are no limits to how many entries you can store and the program is incredibly easy to use.SecureSafe Pro Password Manager is 100% free to download and try. Paying just once for the full registered version of the program, you get a lifetime license, and do not have to pay annual payments. OraDump Export Kit is a set of conversion tools to export data from Oracle dump file into MS Access, MS Excel, CSV, MySQL, MS SQL, PostgreSQL. EMS SQL Query for PostgreSQL is an utility that lets you quickly and simply build SQL queries to PostgreSQL databases. Visual building as well as direct editing of a query text is available. Validate the integrity of credit card number combinations. This software verifies the combination but not the card itself. This software can be used to filter mistyped or fake credit card entries. Navicat (MySQL Client - a GUI Tool for MySQL admin and Access to MySQL, Excel to MySQL conversion).